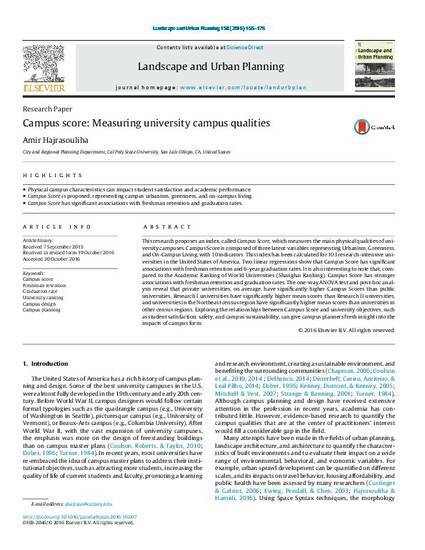 This research proposes an index, called Campus Score, which measures the main physical qualities of University campuses. Campus Score is composed ofthree latent variables representing Urbanism, Greenness, and On-Campus Living, with 10 indicators. This index has been calculated for 103 research-intensive universities in the United States of America. Two linear regressions show that Campus Score has significant associations with freshman retention and 6-year graduation rates. It is also interesting to note that, compared to the Academic Ranking of World Universities (Shanghai Ranking), Campus Score has stronger associations with freshman retention and graduation rates. The one-way ANOVA test and post-hoc analysis reveal that private universities, on average, have significantly higher Campus Scores than public universities, Research I universities have significantly higher mean scores than Research II universities, and universities in the Northeast census region have significantly higher mean scores than universities in other census regions. Exploring the relationships between Campus Score and university objectives, such as student satisfaction, safety, and campus sustainability, can give campus planners fresh insight into the impacts of campus form.